Sonnet Designs: Creative Cowgirls Go Monochromatic! Our theme for the next two weeks at Creative Cowgirls is Monochromatic. I totally embraced this theme and have gone crazy with it. watch my upcoming cards and you will see quite a few like this. I thought this image would make a great card for a younger child so I went with the birthday theme and used the cuttlebug birthday folder. I used my copics to color the image and created a tent topper card. I also decided to make one of these same cards but in a pink color scheme. The only difference besides the colors was that I added some stickles to the dragon's wings. I wanted to do the same for the blue dragon, but the men in my house vetoed that idea! Make sure that you check out Delicious Doodles. It's definitely worth the trip. They will be giving our WINNER "3 IMAGES OF CHOICE" and all of the "TOP 3" "1 IMAGE OF CHOICE". Wow! What great prizes! 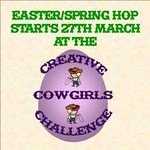 Stop over at the Creative Cowgirls Blog to see all the DT creations. They are amazing this week...as always. There will be a fabulous basket of goodies available for someone who posts the badge (top of sidebar) on their blog and creates a post as well as adding it to their side bar! $50.00 worth of fabulous fun prizes!